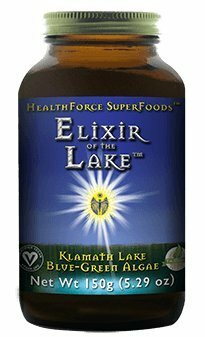 Elixir of the Lake is pure, quality-tested Klamath Lake blue green algae. Among the most nutrient-rich foods on the planet, Klamath Lake algae provides protein, B vitamins, and important phytonutrients that support healthy brain function. Elixir of the Lake is harvested from the deepest and cleanest section of the lake directly into a refrigerated tank onboard a state-of-the-art harvesting boat. The algae is then transported to shore where it is powdered using a low temperature drying process that preserves the algae's natural essence without any degradation in color, flavor, enzymes, or nutrition. Elixir of the Lake is organic, vegan, and gluten-free. TruGanic Purity: Free of pesticides, GMOs, and irradiation; verified by actual testing. Lab tested for botanical identity, heavy metals, and microbiological activity. Available in powder. EcoFresh packaging delivers superior freshness. Manufactured in U.S. vegan facility free of gluten, peanuts, and tree nuts. Energetically enhanced: magnetic, homeopathic, vibrational. Also supports brain, joint, nervous, and kidney function along with physical energy, stamina and a positive and focused mental state. If you have any questions about this product by HealthForce SuperFoods, contact us by completing and submitting the form below. If you are looking for a specif part number, please include it with your message.